These letter formation activities may help your child to master number and letter formations even if your child is still struggling to control a pencil. 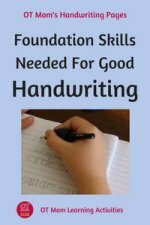 Poor fine motor skills can seriously hamper your child’s handwriting efforts. And it is easy to get frustrated with your child when it is a battle to practice numbers and letters. 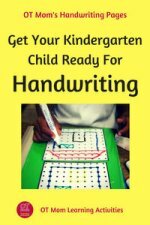 In kindergarten and first grade, there are 2 separate sets of skills being taught in handwriting lessons – one is the art of forming numbers and letters and drawing patterns, and the other is the art of controlling the pencil in order to work neatly. 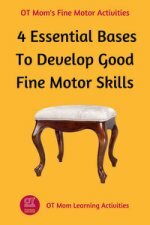 I have found that with this age group, when fine motor skills are poor it really helps to separate the 2 skills, and to deal with them individually. Why keep letter formation and pencil control skills separate? What do I do about pencil control? Why Keep Letter Formation & Pencil Control Skills Separate? So when you want to work on letter formations, don’t require the use of a pencil! 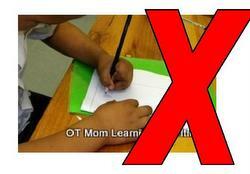 Avoid using pencil-paper activities to work on letters if your child's fine motor skills are poor! 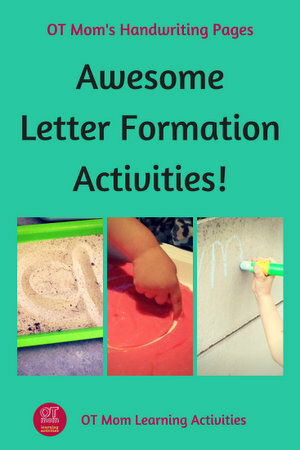 So whether you have a very young child who is eager to learn to read or write but hasn’t mastered a pencil yet, or you have a kindergarten child who is struggling with pencil control, these fun letter formation activities can help them get a head start on reading and writing letters and numbers. Forming numbers and letters correctly from the very beginning can help reduce letter reversals, messy handwriting and errors in later years. Medwell et al (2009) state that "Handwriting is not just about training the hand; it is about training the memory and hand to work together to generate the correct mental images and patterns of letters and translate these into motor patterns of letters - automatically and without effort!" So our goal in helping kids form their letters correctly is to help them to do it automatically, and to free their brains up for higher level thinking skills. There are lots of brilliant activities on the internet that help the child build and form letters and numbers, using playdough, wikkistix, stickers and a whole bunch of other very creative ideas! However, my focus with these letter formation activities is to help children master the visual-motor aspect of a flowing letter formation, in other words to get lots of practice in the movements and flow required to actually write the letter, not to learn to recognize the letter. Your child can develop the feel and technique for forming different letters and numbers, without the stress of controlling a pencil or crayon. Read my Letter Formation Tips and Strategies before you begin! 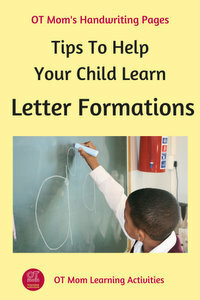 Some of these letter formation activities use thick chalk or whiteboard marker. Being thicker, they usually require less effort to control than a thin pencil. 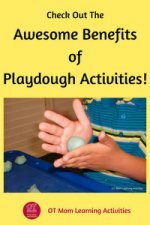 Because the child is usually working in a fun way on a larger surface, the activities are less stressful than working on paper with a pencil. Outdoor activities are always more fun than indoors, and practicing numbers and patterns in the sand hardly seems like work! To keep your child focused, draw a “page” in which to work. If you don't have access to outdoor sand, put some sand on a tray instead. Put some gloopy food on a tray or plate, and have your child trace or copy the letter with a finger. You can try any squishy food that your child likes - such as yogurt, custard, angel delight or Jello instant pudding mix. If your child dislikes the tactile sensation , then put the gloopy food in a Ziploc baggie to get the sensation without the messy feeling! Fill the bag about a quarter full, and squeeze out all the air. You will need to tape the bag down to enable the letters to be formed more easily. Ok, this one is really messy, but loads of fun. Stick your child in a bath or shower cubicle with a handful of shaving cream to smear and write in. For a more tactile experience, let your child use the whole hand as well as just the fingers! Caution! Shaving cream can irritate tender skin, so use the sensitive skin variants, and don’t let it get in the eyes. Use chalk on an old-fashioned blackboard, on a wall, or on the sidewalk. You draw the letter with chalk and have your child trace the letter with a piece of wet sponge . Your child can also use fat sidewalk chalk or a finger to trace your letter before or after the wet sponge is used. Write a number or letter on a whiteboard or chalkboard, and have your child trace it with a finger to wipe it off. You could also use a small piece of dry sponge. NB be sure your child washes the fingers properly afterwards! I downloaded these handwriting activity cards from Handwriting Heroes, printed them and laminated them. They are lovely for kids to trace with their fingers, or to use with write-on-wipe-off markers. The Handwriting Heroes Program teaches the letters in groups with similar formations (eg m, n, r) and also provides a rhyme or story for each letter to reinforce the formations. I used a similar program when my kids were younger and the formation rhymes played a big part in helping my kids learn and recall the correct letter formations. You can combine letter formation activities into a gross motor activity (stick the letters on different walls and have your child hop or jump to the wall to trace it) or use the activity cards in a sorting activity – have your child group the letters by families and recite their rhymes. Working on numbers and letters in fun letter formation activities like the ones on this page, can really help your child to master correct formations. But if your child’s fine motor skills are poor, you also need to help encourage fine motor development. 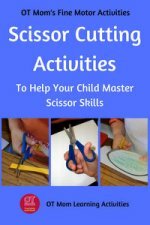 Some kids respond very quickly to the right kind of activities geared to improving fine motor skills. They just need some encouragement and the right kind of opportunities. If you have a very young child, or a child who is just a little behind where they should be, then the fine motor activities on my site may help you to boost your child's development. But if you are concerned about your child’s development, or if your child really struggles to keep up with peers in fine motor skills, I really recommend you get an occupational therapy evaluation and advice as soon as possible, so your child does not have to struggle unnecessarily. 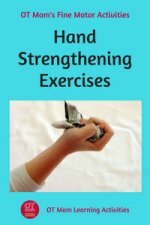 Here are some helpful activity pages that can be helpful for kids who need a boost in their fine motor skills. Thank you for visiting my site! I hope you were helped! Please share this page with a friend if you found it helpful!